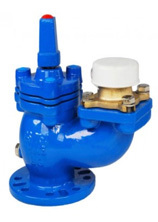 Manufactured in ductile iron, this hydrant fully meets the requirements of BS 750 type 2. Outlet is to gunmetal (London thread design) and ductile iron (Bayonet or instantaneous). Potable water compatible materials to BS 6920 are used throughout. The seating for the stopper is in EPDM to EN681-1 and the whole hydrant is coated in powder epoxy that has WRAS approval.